This week, two California cities, San Francisco and Oakland, announced they are suing five oil and gas companies for allegedly causing global sea levels to rise. For those following the #ExxonKnew saga, it will come as no surprise that this is just the latest component of their campaign. The lawsuit also comes just after the release of an #ExxonKnew study that tried to tie sea level rise to specific companies, and the lawsuit cites #ExxonKnew reporting paid for by anti-fossil fuel foundations. In seeking to sue ExxonMobil and other oil and gas companies for contributing to climate change, San Francisco hired the one lawyer who has spent the last decade conspiring with activists to try and figure out a way to blame individual companies for global warming. So let’s take a look at Matt Pawa, the lawyer hired by the plaintiffs to argue their case. Pawa attended the now infamous 2012 conference in La Jolla, California, where attendees strategized how to hold companies accountable for “climate change damages.” He also attended the secret January 2016 #ExxonKnew meeting at the Rockefeller Family Fund offices where activists strategized ways to “establish in the public’s mind that Exxon is a corrupt institution” and discussed “avenues for legal actions” against the company. Pawa also gave a presentation to state attorneys general before their March 29, 2016, press conference with Al Gore announcing additional investigations of ExxonMobil. When the Wall Street Journal reached out to Pawa to inquire about his role in the briefing, Pawa emailed Lem Srolovic at the New York AG’s office, asking what he should do. Srolovic replied, “My ask is if you speak to the reporter to not confirm that you attended or otherwise discuss the event.” In other words: don’t tell the media the truth. Pawa is closely tied with several groups involved in the #ExxonKnew campaign. He previously sat on the board of the Climate Accountability Institute, which “manipulated academic research to smear Exxon,” according to one report. Before starting his own practice, he worked at Cohen Milstein, the law firm that administered the subpoena from the U.S. Virgin Islands Attorney General to ExxonMobil. Pawa is also on the board of the Center for International Environmental Law, the group responsible for the Smoke & Fumes website, which alleges the fossil fuel industry used the “tobacco playbook” to sow doubt about climate change. Pawa brought a similar lawsuit against fossil fuel companies in 2010, alleging that they were responsible for melting sea ice that had protected an Alaskan village from storms. It was dismissed for lack of standing and Pawa’s appeal failed. Pawa later sued ExxonMobil for an MTBE spill in New Hampshire, resulting in a $236 million judgment against the company. The lawsuit comes on the heels of several other California communities suing 37 fossil fuel companies earlier this summer for causing climate change. Environmental activists are pushing California Attorney General Xavier Becerra to launch his own #ExxonKnew investigation, even as parallel investigations by the New York and Massachusetts attorneys general remain locked up in court. But there are a number of problems with this line of reasoning, the most obvious of which is that we’re all responsible for contributing to climate change. The residents of San Francisco drive cars and fly in planes powered by petroleum and turn on lights and Instagram from phones that are recharged at least in part by natural gas power plants. Our society runs on fossil fuels and it is hypocritical for San Francisco to sue these companies for providing a product its citizens rely on. California emitted 440.4 million metric tons of CO2 equivalent in 2015. The plaintiffs fault oil and gas companies for knowing about climate change in the mid-20thcentury, accusing them of ignoring the “warnings” and proceeding “to double-down on fossil fuels.” But they later admit that the public had also been warned about climate change as far back as 1896. It remains unclear why energy producers are to be blamed for this while the city of San Francisco escapes any responsibility, other than the fact that the city would obviously not sue itself. 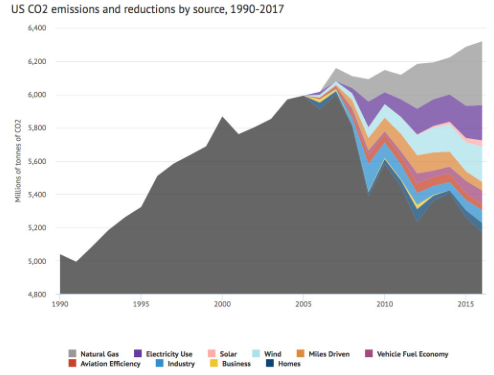 San Francisco also faults ExxonMobil and BP for supposedly understating the expected market share of electric vehicles in their energy forecasts. But it is unclear exactly how a forecast can be understated, as it predicts something, based on presently available information, which has not yet occurred. That would be similar to accusing a meteorologist for understating next Sunday’s temperature – you cannot know if they were correct until Sunday arrives. That’s a pretty spurious argument on which to rest your case. The public has known for decades of the link between burning fossil fuels and global warming, yet society has continued to use oil and natural gas because there are still no alternatives that match their low-cost, their energy density, and their dispatchability. San Francisco continues to use fossil fuels as it seeks to blame others for that use, which is a perfect explanation as to why this lawsuit is but the latest hypocritical component of a larger political campaign.